North Marion varsity boys soccer coach Rafael Pelaez was selected the 2018 4A State Boys Soccer Coach of the Year last week after guiding the Huskies to their second state championship appearance in school history. 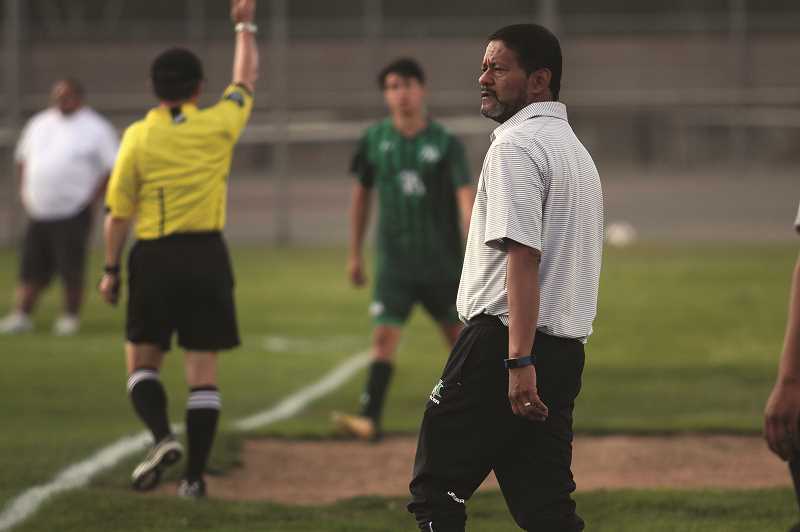 Pelaez guided a North Marion team that finished second in the Tri-Valley Conference and entered the state playoffs as the 13-seed to a title match with the Woodburn Bulldogs, where the Huskies fell 2-0 to finish runner up. Along the way, North Marion (10-5-3, 6-1-3 Tri-Valley) scored upset after upset as the fourth-lowest seeded team in the playoffs, defeating the No. 4 La Grande Tigers 2-1 in the first round, followed by a 1-0 victory in the quarterfinals over 12-seed Seaside. The Huskies' biggest victory came in the semifinals where the team knocked off the previously unbeaten No. 1 Phoenix Pirates to score a rematch against the eventual champion Bulldogs, who North Marion lost to in the season opener for both teams. This marks the second time Pelaez has been named the state's top coach. He previously was named 4A Coach of the Year in 2014 after leading North Marion to a 17-1 record and the team's only state championship win in program history. Pelaez became the head coach of the Huskies in 2011 and over the past eight years has led North Marion to a 78-40-13 record, including a 47-22-11 record against league opponents. The Huskies have been to the post season in every season under Pelaez's tenure, going 13-7 with four trips to at least the quarterfinals. Under head coach Rafael Pelaez, the North Marion boys soccer team has been one of the most consistently successful programs in the 4A Classification over the past eight years.